Baked Buffalo Ricotta is a truly creamy delicious way to eat cheese. baked and served warm for a very impressive snack. Once upon a time I lived in a tent in the lakes district of England. This campsite home ,was just outside Staveley near Lake Windermere. Mostly it is not fun living in a tent but to complicate this I also worked in a tent. I was a rep for a travel company and it was my job to feed and house mostly Australian and New Zealand coach passengers. When I say house, I mean the tent accommodation provided to them, was often thrown into the creek by angry wind snarls. After re-pitching and cleaning, I provided both lunch and dinner cooked in the cook tent over large gas burners, with trestle tables for benches and boiled water and plastic bowls for washing up!. During my time in the Lakes District, I drank a lot of beer and ate a lot of fish and chips, cause I am such a good hostess…….and was encouraged to show the visitors around . Consequently I gained a lot of weight. To remedy this growing problem I became acquainted with the local ricotta cheese. There are a number of Artisan cheese producers in this area, and the ricotta was beautiful. 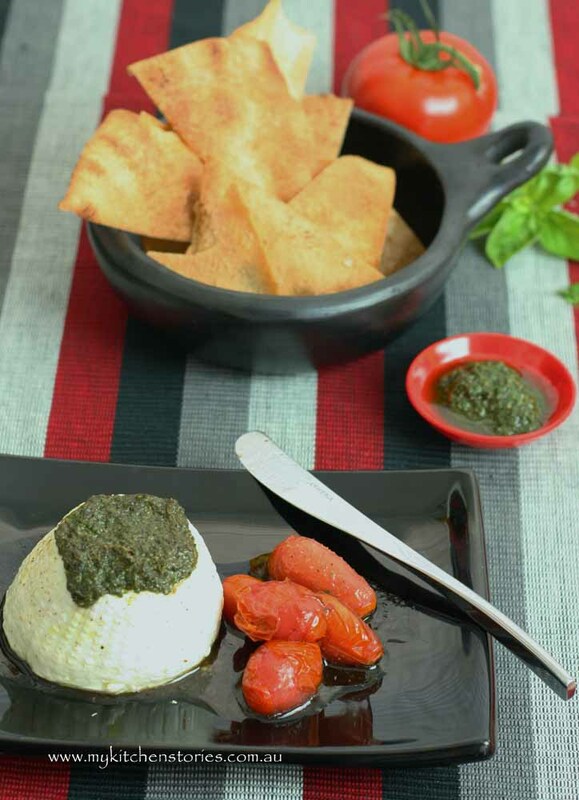 I wrote an article for the local paper , The Westmorland Gazette, about what makes ricotta so delicious to eat and added recipes, this was published. This made absolutely no difference to my weight loss program. 58% more calcium than cows milk! 40% more protein than cows milk! 43% less cholesterol than cows milk! I like facts, but really I am more interested in what it tastes like, and I can tell you it is far more creamy and white than cows milk ricotta. 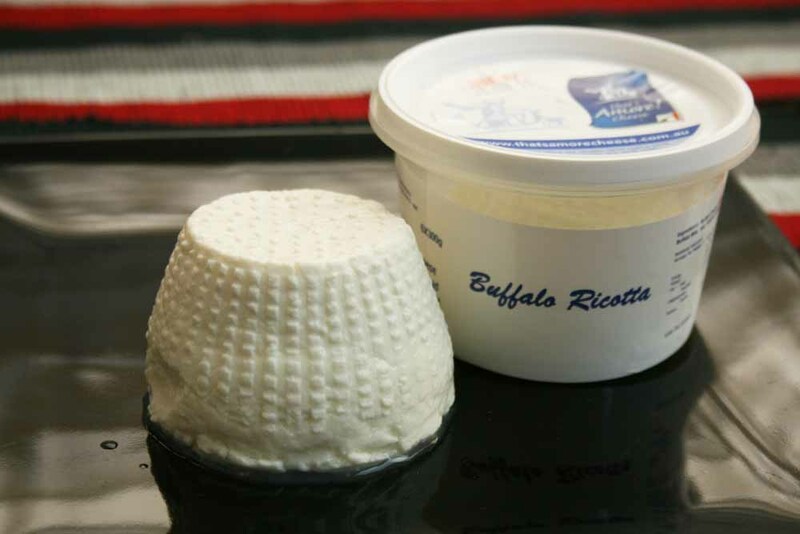 Buffalo milk is higher in milk solids and so the whey used to cook the ricotta is creamier , producing a smooth almost blancmange textured cheese. 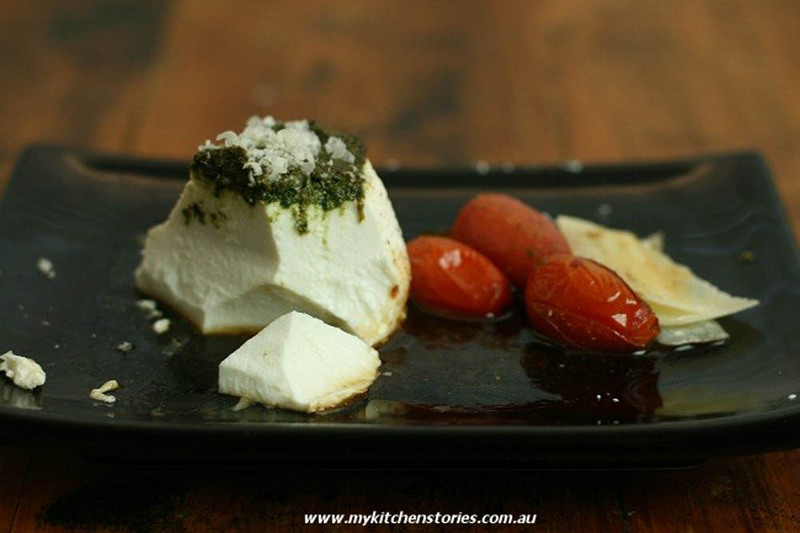 I wanted to compliment the texture and flavour of this cheese by keeping it very simple. 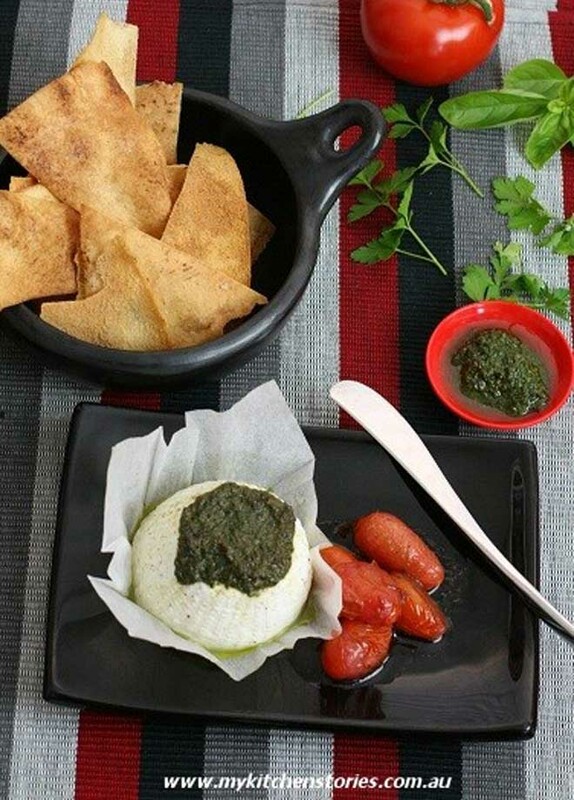 I have made some Lebanese bread crisps, baked the ricotta with basil and tomatoes. 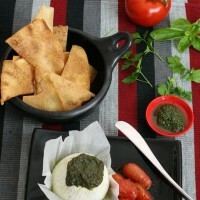 You can buy a nice pesto if you like, but I will include a recipe for Basil Pesto. 4 pieces of Lebanese Bread cut into triangles. Place the basil, parsley pine nuts, crushed garlic and parmesan in a food processor and process to combine. Turn the ricotta onto a muffin paper I used the one pictured but you can use a round muffin paper. Spoon 2 Tablespoons of pesto onto the top of the ricotta . Bake the cheese and tomatoes for approx 20 min. The oil in the pesto will start to separate and the tomatoes will be soft but not mushy. Cut Lebanese bread into pieces separating the layers of bread. Toss the bread pieces in olive oil and salt, not too much oil. Rub the pieces around the bowl and together and then put onto a baking tray and bake until crisp and golden. 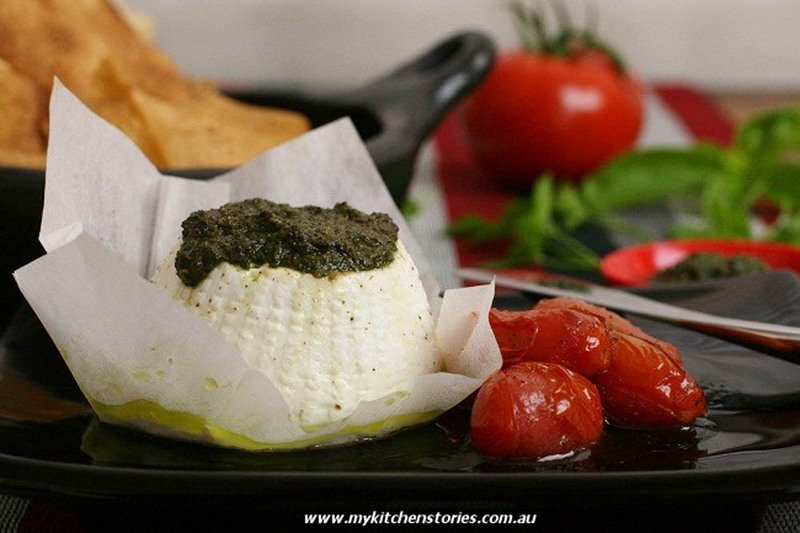 Pictures look as fab as the ricotta tasted! What a girl! Okay seriously, I’m looking at this recipe and dying it’s so gorgeous. Then I look over at your background and more yumminess. I am on hungry overload now.